Kiwanuka is one of those games that’s virtually impossible to categorize in an iOS gaming library. While it might be defined as a puzzler, it’s more of a game of strategy. Yet should you become invested in the lives of the game’s little wizard-like shepherd and his flock of followers, it’s also a sort of adventure. 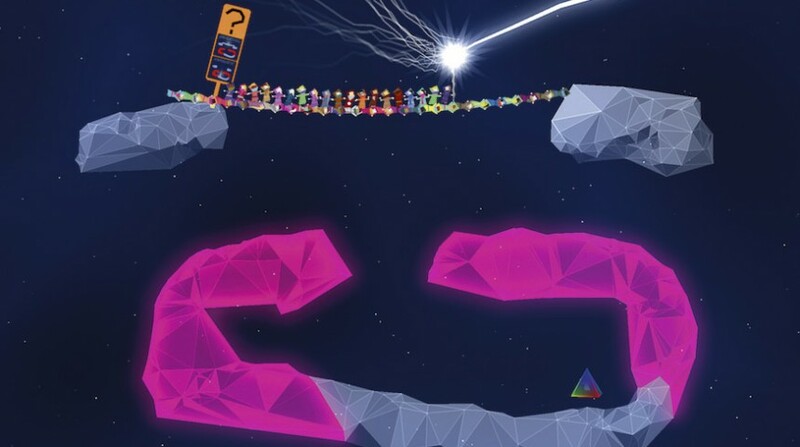 However you slice it, Kiwanuka, developed by CMA Megacorp, is a fresh, fun, unique little gem of a challenge. Played out across 30 bite-sized stages, you guide a funky, robed nomad—complete with a massive, glowing staff that gives him control over his people—and his growing army of raver-like Kiwanukan followers across, up, over, under and around various obstacles to reach an imprisoned compatriot at the end of each level. Since the stages are littered with floating rocks and ledges, you have to use your mystic powers of follower-manipulation to build “people-ladders” to swing around anchored positions and latch onto distant outcroppings. Once you human-rope-swing your way to victory, you’re treated to a psychedelic visual bombardment as your captive companion is freed from his or her prism prison. With a sense of achievement as you figure out each puzzle—and a pretty funky electro soundtrack on the way—Kiwanuka is a good choice for breaking up the grinding gridlock hours. Cirque du Soleil your way through crystalline levels.